Documented collecting histories are important. The portrait heads of Drusus Minor and Tiberius excavated at Sessa Aurunca have parallel histories. Both passed through the sale of PIASA in Paris on 17-18 March 2003, lot 569, and 29 September 2004, lot 340. Both came from the same source ("Cette tête de même provenance que la tête vendue le 18 Mars 2003 "). The Drusus was reported to have been purchased by Phoenix Ancient Art, who then sold it to the Cleveland Museum of Art in 2012. It was displayed in the New York exhibition, "IMAGO: Four Centuries of Roman Portraiture", with the information that it had formed part of a 19th century Algerian collection ["Phoenix Ancient Art to Exhibit Collection of Roman Portraits, Unveil Its Newly Renovated New York Gallery", 29 November 2007]. The Drusus appeared in Randy Kennedy's article, "Museum Defends Antiquities Collecting" (originally from the New York Times, 12 August 2012). 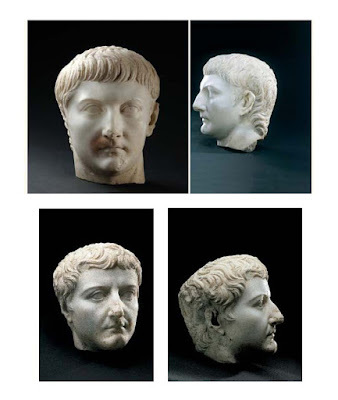 The article specifically states, "The Cleveland Museum’s new portrait of Drusus Minor has no ironclad record pre-1970". It is noted, "But the museum said it believed its history could be traced back to the late 19th century as the property of a prominent family in Algiers." The source for this collecting history is unstated though was in circulation in 2007. David Franklin, the then director of the Cleveland Museum of Art, was quoted, “We’ve done our due diligence and we feel that both these objects have a pre-1970 provenance” [the other piece was Mayan]. The Tiberius was purchased by the Royal-Athena Galleries and then sold to the US Private Collector. I am told that the private collector returned the head to Italy in January 2017. It is unclear when the pieces were removed from the Antiquarium in Italy. I am grateful to Dr Jerome Eisenberg for the additional information and clarification.